Detectives in Franklin are investigating a substantial and unusual burglary at a Cool Springs business. Employees of the AT&T store, 3021 Mallory Lane, discovered the break-in shortly after 8am, when they were arriving for work. Caught on camera, three masked felons can be seen heavily damaging the inside of the business, breaching doors, breaking cameras, and working together to pull off what appears to have been a highly-planned burglary. The burglars first pried open the front door to an adjacent nail salon. 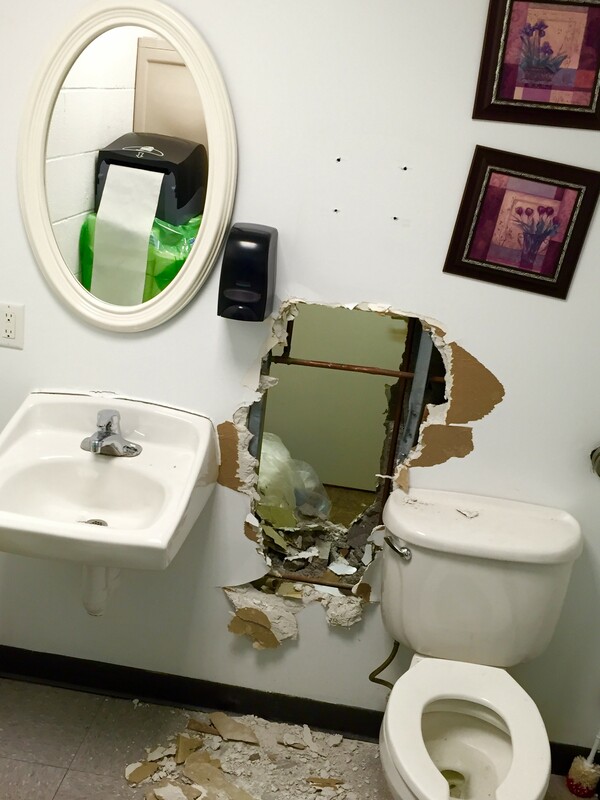 Once inside, they made their way to the bathroom where they used tools to bust through a shared wall. Once inside the phone store, the suspects moved with precision seen only in cases involving very experienced criminals. Dozens of smartphones, tablets, and other items were stolen. A complete inventory is underway, but losses were initially estimated in the tens of thousands of dollars. The burglary is believed to have occurred sometime around 4:30am. Anyone who may have seen something suspicious around that time is asked to contact Franklin Police. A reward of up to $1,000 is available for information, by calling Crime Stoppers: (615) 794-4000.